More and more people are now taking Internet in Bitcoins trading. But most of the people are trusting on hosted wallets of exchanges where they are buying. I have already told this many times that you must think of giving your private tokes best security you can offer. So, your wallet must be safe and trusted. And here comes the hardware wallet. Hardware wallets promise enhanced security against software wallets. Your coins are safe even if your computer is hacked or someone stole your hardware wallet. If you lose your hardware wallet, all your coins on a new wallet can be restored on a new wallet. Your secret pin code is the key that is necessary for transferring your Bitcoins or any other coins from your wallet. Hardware Wallet is an electronic device designed keep your private keys on your coins. All operations and transactions are executed on the device and it only displays the result. It also displays some information on the screen. You are required to set up a PIN code and it is used to access and authorize the transactions. It can support one or more currencies. You need to keep the recovery phrase safe with you as it is the only thing you need to recover your coins. If you are serious Bitcoin trader, you must use Hardware wallet. 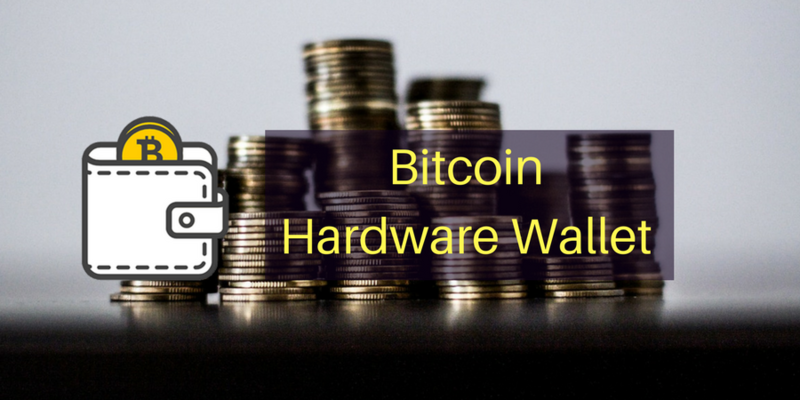 In this article, I am listing 3 best hardware wallets to keep your Bitcoin safe. If you have read my older articles on Bitcoin, you know that I always recommend Ledger Nano S. It is sleek and attractive. It allows you to keep Bitcoin along with several other coins. You can backup the seed key for recovery of your bitcoins. It looks like a flash drive and features a display along with two buttons for navigation. You need to connect it to PC or mobile phone via USB to use it. Trezor is also a good hardware wallet. It looks like a small calculator. It randomly generates a nine-digit pin and a 24-word recovery seed key for securing your cryptocurrency. It also has an OLED screen. It keeps your private keys and transactions offline. KeepKey is another hardware wallet available in the market for keeping Bitcoins. It is bigger in size, not convenient to carry and does not offer many features as compared to Ledger Nano S or Trezor. It also works similarly and generated Pin code and recovery phrase. It also has an OLED display for showing important information. Note: Hardware wallets keep your keys offline and offer security, but you need to keep your recovery seed key and/or PIN code safe. If you forget it, you cannot access your coin. So, always note it down and keep it in a safe place. I also recommend you to make 2-3 copies of this key and keep all of them in different places. Now you know the best Hardware wallet for Bitcoins. I recommend Ledger Nano S. But, the last choice is yours. So, you are free to select what Bitcoin hardware wallet you want to buy.